Name of School/ Board/ Univ. * I hereby certify that the information provided above is true to the best of my knowledge and belief. 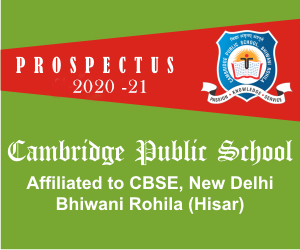 If any information is found to be false/ incorrect, it will disqualify me for employment in CAMBRIDGE PUBLIC SCHOOL, BHIWANI ROHILA, HISAR.